L’Occitane’s new Shea Butter range also includes an Ultra Rich Face Cream (€36.95), Protective Cream with SPF 20 (€36.95) and Ultra Gentle Moisturiser (€31.95). 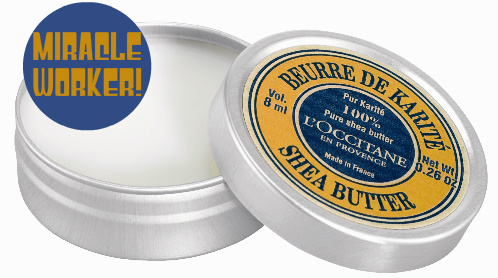 It’s available from L’Occitane stores nationwide or from Arnotts, Dublin. Have annoying dry patches on my cheeks, will be stocking up on this stuff! @Jen This stuff should clear your dry patches right up! @Mandy, tis great stuff altogether! this looks like a good product, I love this french brand! This is a miracle worker...I can attest! Happy weekend! you are so sweet! i love L'Occitane, i use their cuticle lotion all the time! Did not know that l'Occitane was that expensive. I see one of their stores in Manhattan but was never tempted to go in to check what they have. Now with prices like these, they will not see me. Shea butter is really good for skin but also for hair. It it so rich that it turns dry skin/hair into a smooth one. I use the raw shea butter. $5 the pot. It can last for months. I love L'Occitane, I'll have to try that SPF20 cream, I think. I love this brand! They make the most amazing hand creams. Is it new? What is different from the old shea range? I have this, but only use it on my lips. I feel like I only got the full effect after I moved to a warmer climate because it goes rock hard in the cold and it's hard to smush it properly before putting it on. It is a little miracle worker on dry lips! Hey T, as far as I can tell there were shea body products out already but the new range comprises the 3 products mentioned in the post.